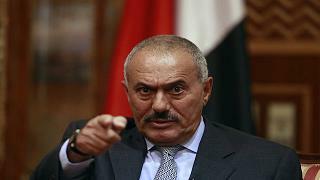 The former Yemeni President Ali Abdullah Saleh has been killed today. He was 75 years old but still very active in Yemeni politics. Video of his dead body being thrown onto the back of a pickup is making the rounds. One hears Houthi slogans shouted in the background. The pictures show a gun wound on the chest and at the side of the head. The face is easily recognizable. There are also pictures of his ID card. Though several media report his death there is no confirmation yet from his GPC party or his family. Over the last few days Houthi media had announced several times that Saleh had been killed. This morning Saleh’s house was blown up. This time the Houthi news proved right. The circumstances of Saleh’s death are not yet known, but it was said that he was fleeing Sanaa when fate caught up with him. As we wrote in our recap on Saturday, Saleh had suddenly made peace with the Saudis and asked his followers to take up arms against his former allies. For more than two years he had allied with the Houthi against the U.S. and UK supported Saudi invasion and proxy forces. On Friday, after several days of local clashes with the Houthi, he had called for his followers to throw the Houthi out of the Yemeni capital Sanaa. For a day his fighters, led by some 1,000 soldiers of Saleh’s personal guards, were successful and the Houthi were kicked out of many of their positions. But they were not defeated. They called up more of their troops and on Sunday regained the lost ground and buildings. They occupied Saleh’s media. His TV station started to transmit his enemies chants. Over the last night and throughout today they defeated Saleh’s troops. It is yet a mystery why not more of Saleh’s supporters came to his help. Sanaa is his home turf and whenever he had called for demonstrations in the city, hundreds of thousands attended. For much of his 34 years of rule as president and even after his forced resignation Saleh could call on the seven “collar tribes” who’s territory surround the capital. This time they did not come to his aid. Saleh also continued to command significant parts of the former Yemeni army. These currently hold positions far outside of Sanaa against Saudi proxy forces who try to conquer the mountainous territory of northwest Yemen. One wonders why he had not called them back in time. It may be that his unexpected turn-on-a-dime towards a new alliance with the eternal enemies of Yemen, the Saudis, has alienated his followers. The Saleh family and clan is quite big and resourceful. Many of his relatives have held high military positions in the Yemeni army and keep enough money to pay for their troops loyalty. Some nephew of his may take up his banner. It is unsure though if such a replacement could gain the following of the former army units Ali Abdullah could call on. The Saudis had recently bet on Saleh to end the stalemate in their war on Yemen. Had he won out, it could have meant a pause in the war and probably its end. With the Houthi now having the upper hand in Sanaa, the war, the permanent Saudi bombing and the blockade of Yemen are likely to continue. The Houthi will continue to attack within Saudi Arabia and the fight against the Saudi proxy forces on the ground will go on. It will need another breakthrough event for the war to stop. @BaFana3 – 6:49 AM – 4 Dec 2017I cannot describe the deep grief I feel. Ali Abdullah Saleh was the greatest leader #Yemen ever had. He never surrendered: He died a martyr in his homeland Yemen, as a Yemeni fighting for Yemen’s cause. I salute Yemeni president Ali Abdullah Saleh, both in life and in death.